DJ demonstrates an "in the style of" lick from Curtis Mayfield that centers around an F#m7 chord. 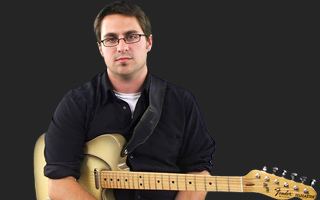 DJ Phillips starts out his funk guitar series with an overview of what he'll be covering in lessons to come. In this lesson DJ profiles guitarist Jimmy Nolan, one of the original members of the James Brown band. DJ takes another in depth look at Catfish Collins' playing style with "in the style of" licks. DJ begins lesson 10 of his funk series by going over one of Curtis Mayfield's signature licks.